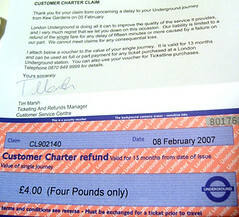 I often wondered how many people used the Customer Charter refund for delays on the Tube and now I know. 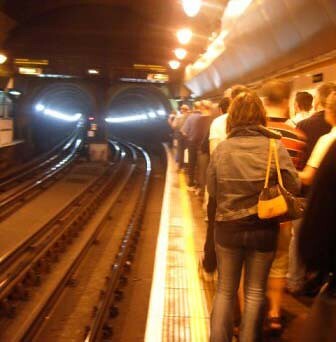 Yesterday figures were released which showed a record number of claims for delays on the London Underground. The total number of claims almost doubled from 261,725 in 2004 to 447,626 last year. The Metropolitan line had the highest number of complaints last year, with 97,773 passengers applying for refunds, up from 60,853 in 2004 - but down from 111,504 in 2005. The Central line was also poor with 92,336 refunds last year, compared with 58,783 in 2004, and surprsingly the Northern line was third on the list with 56,805 claims, compared with 29,755 two years before. Perhaps delays are such an everyday occurance on the Misery Line that it becomes a normal part of the journey and regular commuters can't be bothered. The number of refunds claimed from commuters using the Piccadilly line more than doubled, from 25,282 in 2004 to 51,619 last year. 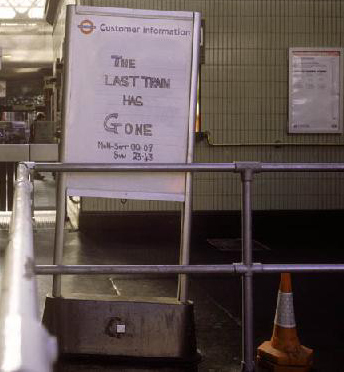 The Waterloo & City line was the only line to show a fall - but that's probably because it wasn't running for much of the time and was closed for five months. Stephen Hammond, MP for Wimbledon and the Conservative transport spokesman who uncovered the figures said they showed the Mayor was not delivering value for money. He said: "Ken Livingstone talks a great deal about his £10billion investment plan for London transport. These figures show just how little he has achieved with all that money. The Mayor's council tax precept keeps on rising and fares have gone through the roof but commuters' journeys just get worse." According to the Evening Standard TfL were unavailable for comment. I would urge people to keep claiming when they get delayed. Less than half a million claims in a year is still a drop in the ocean considering there were 971 million passenger journeys in 2005/2006. This year I've already received £20 from the Customer Charter refunds for delays on the District Line and it's not even two months into the year. It takes about three minutes to make your claim and at the moment the refunds have come back within a few weeks. 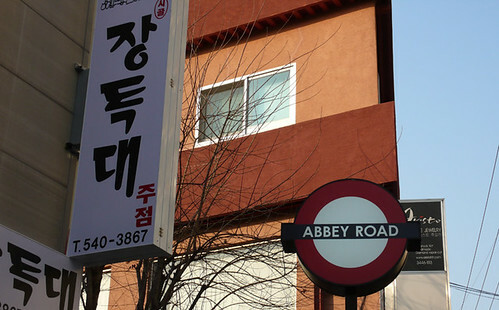 Thanks to Jon Allen for managing to spot a very realistic looking Abbey Road in Seoul. He said "It's for a cafe/bar in the Apgujeong district of Seoul." Lewis said: "Slight rip-off of the Harry Beck classic here; showing locations of various pubs in the York area. I think the lines are supposed to be bus routes, but they're numbered and coloured wrong if so..."
Thanks to both, and please, keep them coming in so I can add to the growing Flickr set. 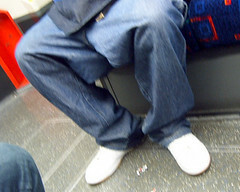 It's Friday and time again for the TFV's or Tube Fashion Victims, commuters spotted on the Underground with their own special look. He said, "It appears to be a coat with the buttons on the back!". Which begs the questions - did it have matching buttons on the front? Or perhaps there were no buttons on the front and she was going for the straitjacket or rather straitcoat look. Gucci designer belt, check. Calvin Klein underwear showing at just the right level, check. Over shoulder man bag, check. Box fresh white trainers, check. Woolly gloves hanging from belt. Erm, not so sure. I suppose it puts you in a bit of a quandary when your pockets are too small to hold your gloves. Particularly if you don't want any disturbance to the smooth lines of your skinny jeans or denim jacket. But why didn't he put them in his man bag? I could be doing him a disservice here, as it might not be a man bag, but a camera bag. Although judging by the rest of the metrosexual look, I think my first instinct is correct. Perhaps it's an unusual winter version of the hanky code. That's it for now. The previous set of victims can be found here and the complete picture gallery can be seen on the following Flickr set. If you picked up yesterday's Metro you'll see that they are running some awards for the best British Blogs. Bless their little cotton socks as Metro suggested a number of blogs including this one as possible nomination fodder. They said "With millions of blogs out in the wild, picking out 'the best' is simply impossible (and obviously, we don't want to influence your nominations for the awards). But here's some British blogs that a lot of people like, that we like, and we think you might too". To nominate the blogs you like or submit your own (there are eight categories Arts and Entertainment, Fashion, Sport, Politics, Travel, Technology, Youth, and Weird & Wonderful) visit this link. What was a tiny feature in The London Paper last night was actually known to intrepid die-hard Tube Challengers many months ago. 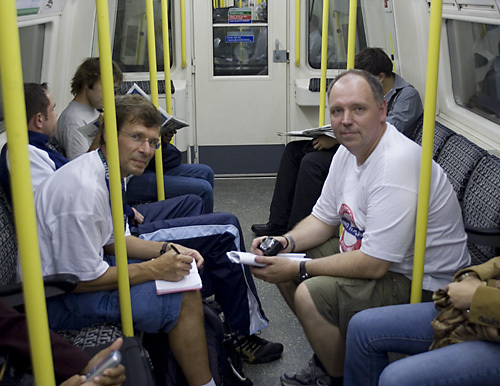 On the 26th September Håkan Wolgé and Lars Andersson from Sweden, set a new record breaking time of 18 hours 25 minutes and three seconds for "Travelling the London Underground in the shortest time" - this means all 275 stations on the Tube. Guinness World Records confirmed the record on the 6th November (which beat the previous holders of the record - Steve Wilson and Samantha Cawley - by just over 10 minutes) and now this has slowly made its way into the London press. "I had a close brush with doors closing around my knee, with Lars onboard after a communication glitch between us. After an eternity (probably at least 10 seconds) of me gesturing that I was stuck, the train driver finally conceded and reopened the doors. However, she didn't start immediately but spent another 10 seconds to give me a verbal bashing over the speakers"
"When all the Arsenal/FC Porto fans invaded the train and we realised we would lose a few valuable minutes and subsequently would miss a crucial change - which we did (probably cost us the 23:38 finish)"
So from a 5am start at Amersham they finished at 23:53:11 at Heathrow Terminal 1,2,3 catching the very last train of the day, as the one scheduled for 8 minutes later never arrived. Hakan concludes: "Since our result was first known, one question has been put to me more times than any other: - 'How fast do you think it could be done?' Since my entire route is based on a statistical model I think I may have a good guess at it. As I've written numerous times, we expected a time of 18h10m, provided there were no extraordinary delays......On a lucky day I think it could be done in 18 hours flat." So the challenge is out there waiting to be broken again. Visit the busy Tube Challenge Forum to see if you've got what it takes. Looks like Alan Connor has found a good contender for the worst smelling Tube station. In October, I found a New York smelly subway station / Google map and asked what the worst smelling station on the London Undeground might be. From your comments Bank, Angel and Waterloo appeared to be the worst. As Alan says "What with the sewage and the roof falling in, London Bridge is sometimes better avoided." Perhaps the sewage is also causing the reduced escalator service there too. Please help me pass london underground interview. 1,list action u wud take.2,xplain what u hope 2 achieve.? imagine u are workin at d barrier of a london station.an elderly tourist wit limited english comes up 2 u.he is carryin a number of bags n he is able 2 comunicate that he is lost and needs to get 2 heathrow. At the time of blogging - you have 4 days left to help the poor person out who also appears to have fairly limited English themselves. Also looking at their background or rather the only other question they've asked, maybe their other interest has affected their ability to type properly. Any TfL staff reading this, if you end up interviewing him - please don't ask what else he thinks he can bring to the position. 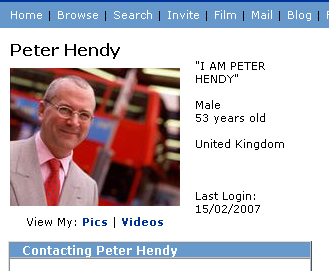 In a story that's clearly too good to be true, the Evening Standard gleefully reported that Transport Commissioner, Peter Hendy had a MySpace page and "has been spending evenings, weekends - and even part of his working day - in the chatroom with teenagers on the MySpace website." The paper continued "Mr Hendy also posts his official TfL biography together with portraits of himself, the TfL logo and a picture which he has entitled "Me With Some Of the Buses". TfL confirmed last night that the site was genuine. "It is not a spoof," a spokesman said. 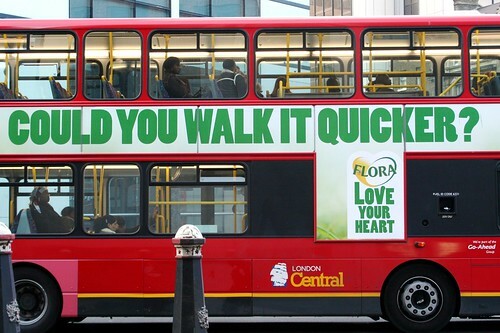 "Any dialogue with Londoners to promote our policies is welcome." Peter had apparently been getting into discussions with other MySpace users about the Tube service. "7 of Hearts" complained "your underground staff at Eastcote station, Hillingdon, were mean to me...What do you propose to do about it?" Within minutes, Mr Hendy apparently replied: "When I get to work on Monday morning I'll sort this out, I'll either sack them or give them a good spanking (not myself but someone lower down the food chain than me.) All the best, Peter Hendy." Were alarm bells not ringing with The Standard at that point. Apparently not, as the paper then stated that TfL said that particular exchange with "7 of Hearts" had not been written by Mr Hendy and they would investigate. I wonder who the person was at TfL who had confirmed the authenticity of the site. Now you'll see that whoever built the site had to fess up that it was a spoof. Well quelle surprise! "Since the recent appearance of this account in the Evening Standard, we feel it is appropriate to point out This is a SPOOF myspace account. Purely based on our Love for Mr Hendy - he is in no way affiliated with this account, nor is Transport for london. 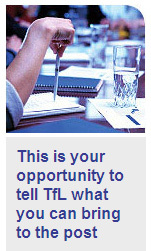 Please direct any questions to TFL website." Expect to see Ken Livingstone's MySpace page coming soon! Being a bloke, I didn't pick up straight away, but when I finally turned around. She made look at the guy about a metre away in the middle of the carriage. He looked a bit dopey and I couldn't work out what the fuss was about until I looked down.. The guy was wearing some grimy trackie bottoms and had what can best be described, before watershed, as a baguette at half mast poking inside his trousers! He was pretty obviously going commando! It was hilarious/distressing/disturbing all at once! Almost like he was wearing something as a joke. But he just stood there and stared at people then sat down opposite the poor girls and arranged himself. The funny thing was everybody had noticed but everyone was making up conversations (rhubarb rhubarb rhubarb...) and trying to avoid eye contact. I'm not sure if this guy was all there... or whether he was actually a pervert. He was very scruffy and obviously had taken zero measures to cover up what nature had obviously "blessed" him with. I wonder if the Tube keep files on people like that if reported?" I'm sure they probably do. Not long ago FridayCities reported a man who was doing some pretty unsavory things with his trouser snake into a copy of Metro. The reporter said "I sent this as a letter to The Metro as I know they like to hear nice stories of people sharing their paper, using it to mop up spills etc. Unfortunately they did not see fit to publish it." Does anyone else have any similar stories? 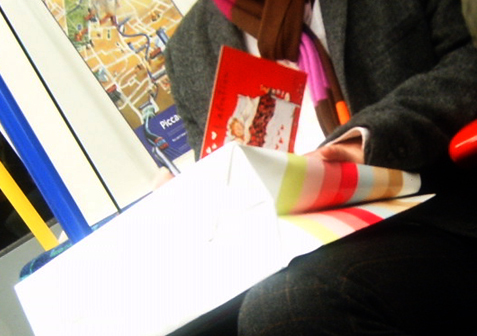 Initially I thought, what a last minute merchant, writing out his Valentine's card on the Tube. But I was impressed that he spent so long writing it. Perhaps he was scribing a poem or a short story, but it was clearly more than "Love you lots". He also spent a good few minutes reading what he had just penned to make sure it fitted the bill. Perhaps the lucky person was also going to receive the contents of the Office bag on his lap. It's an Eastbound Central Line train running between Buckhurst Hill and Loughton. Marc said "The title, and the recurring words to the song, translate into English as "It's beautiful in the metro." 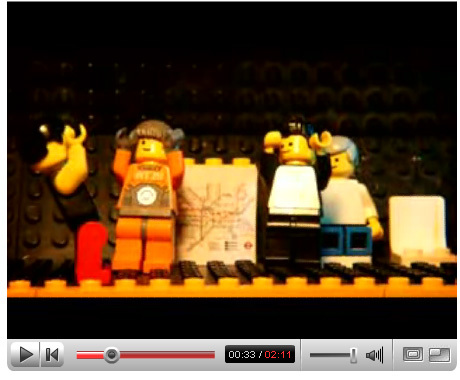 Occasionally they show a brief image of a bus driver who adds the words 'and on the bus.' Actually, the metro is indeed beautiful – the stations were designed in a very dramatic modern style that is (or was) quite appealing." Here are the lyrics if anyone fancies a sing along. Peux-tu en dire autant dans ton auto ? The internet translation makes it seem like it's a weather forecast for the Metro with beautiful blue skies and where everyone's heart is sunny. It's like a cheesy Eurovision Song contest entry and it would be fab if we had the same for the Tube. According to Bob Crow "the golden opportunity" to resolve the latest pay dispute didn't go too well. London Underground's managers and union reps met to discuss the pay rise and although LU said talks were "constructive" no agreement was struck. But there's still hope, as the LU spokesperson said "London Underground again put forward what is a very fair, final three-year pay and conditions offer. "It is a three-year deal with an above inflation pay rise in each year, plus a cash bonus for all staff if customer satisfaction targets are met or exceeded. "We are hopeful that we can reach an agreement without the need for industrial action." RMT leader Bob Crow said "Our members have been waiting since last April for the pay rise that is due to them, and all we have sought for the last year is the opportunity to negotiate seriously." I lost count of the times I heard "Ladies and Gentlemen, there are delays on the .....(insert virtually every line)" yesterday. London's biggest snowfall in 7 years (or 15 if you go by This is Local London) was accurately predicted as early as Tuesday. Even down to the right day. Yet the transport system still couldn't cope because the snow was too sticky. The Met Office said that snow was unusually large. 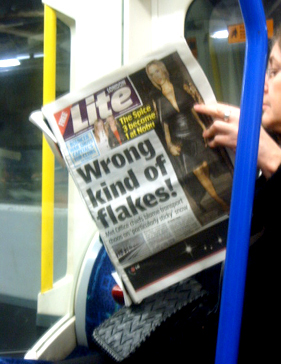 London Lite gleefully reported that "These giant snowflakes with their increased moisture are sticking together far more than expected, causing it to settle quicker and deeper". Geoff Pope, chair of the London Assembly transport committee, said there was "no excuse" for major transport disruption due to bad weather. "The Met Office has given ample warning of snow, and one would expect that Transport for London has taken steps to ensure that trains can still run without disruption." 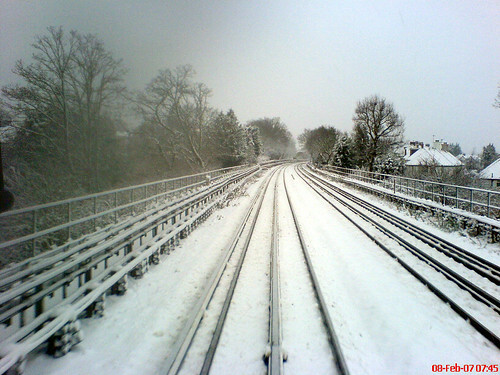 The Piccadilly and Bakerloo lines were partially suspended throughout the morning with breakdowns and signal failures caused by snow. There were also delays on the Circle, Metropolitan, Hammersmith & City, Central and Jubilee Lines. Inevitably the Northern Line had problems and was suspended between Morden and Kennington. Temperatures of minus 5C overnight are expected to cause ice on Tube and train tracks so we may find that the wrong type of ice is a problem today. Network Rail and London Underground are putting more engineering staff on duty to try to keep services running. 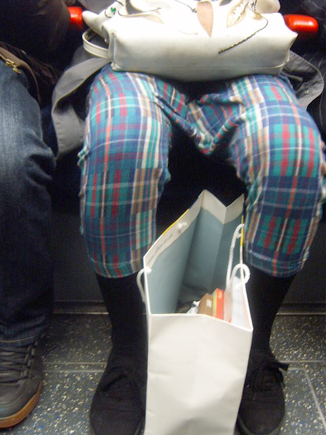 It's the regular Friday look of people on the Tube who've taken a style and made it their own. The combination of nursery look ducks, with denim and suede toe caps was just a little too much of a mix for me. Not helped by very loose trousers tucked inside. 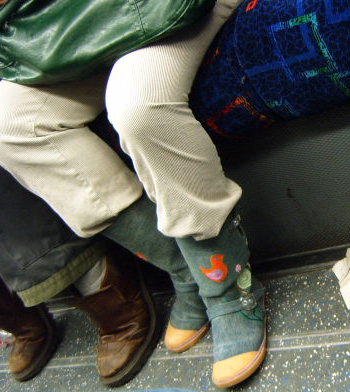 But if you're going to buy boots with ducks on them, I suppose you wouldn't want them hidden. Is it a charm bracelet with an oversized "charm"? 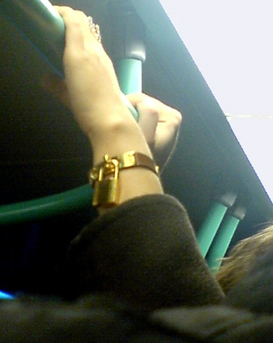 Or just a interesting way of making sure your watch doesn't get swiped on the Tube? I know close to jib all about Second Life, the virtual world which has millions of people trading, buying, selling and generally living another life online. 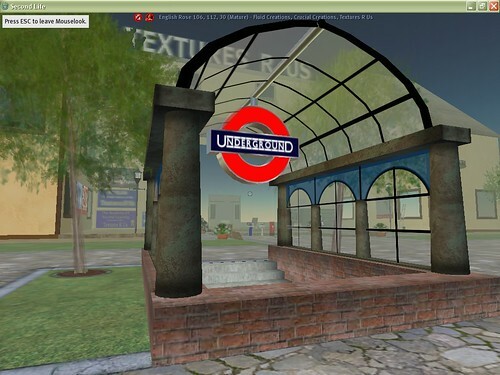 However, thanks to Andy Green, I've learnt that there's a Tube station on Second Life too. 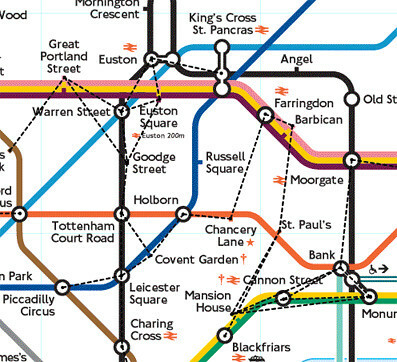 Please tell me that this is just a fascia though and that there isn't actually a Tube line that you can travel on? Or is it something that could potentially develop if people wanted to "build" one? Who would own it and would you have to pay to travel on it? I'm assuming there's a currency in Second Life, but are there virtual Oystercards? Personally I can't think of anything worse than travelling on a virtual underground. The real one is bad enough, so why would you want to put yourself through this in a virtual world? and then break dancing on the platform before the train pulls in. Looks like plans to have the Tube running for an extra 30 minutes at night on Fridays and Saturdays have been put on ice, as Ken Livingstone says the rail unions pay demands to keep it running are "prohibitive". 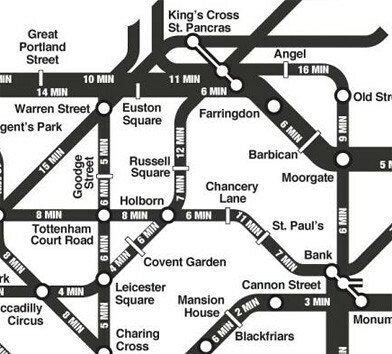 Ken had planned to get Tubes running on Friday and Saturday nights until 1am from May 2007. This is after a public consultatation which attracted 54,000 responses, with the majority in favour of the late night service. The changed timetable would have meant a boost London's "late night economy" (pubs, clubs & eateries). Although British Transport Police were gearing up to cope with the extra "business". Ken offered what he claims to be an "incredibly generous" salary deal that guaranteed staff an extra three days annual leave. But both the RMT and Aslef have turned down the three year package which includes a four per cent initial pay increase and above-inflation increases in following years. "ASLEF negotiators have rejected the offer we have made, including the three days’ extra holiday, without putting it to their members. ASLEF are asking for more pay in return for working half an hour later. "The extra holiday offered to drivers to compensate for the unsocial hours caused by later running on Fridays and Saturdays is an extremely reasonable offer. I believe that if ASLEF and the RMT were to put this offer to their members there would be considerable support for it. "I have no intention of increasing it. We want to introduce late running and I remain committed to it but we cannot do it at any price for Londoners. If the price is too high it is better to suspend it for the present.."
Of course Bob Crow from the RMT isn't taking this lightly and said "It is the mayor who has insisted on a link between last year's pay rise and late-night running, not RMT. It is now three weeks since the mayor told us he would get Tim O'Toole around the table with us to thrash out a solution, and that has still not happened." "All we want to do is sit down and negotiate the pay rise that our members have been waiting more than ten months for. RMT warned the mayor two months ago that plans for late-night running were in disarray thanks to LUL's insistence on linking them with the pay round, and it is preposterous to try to place the blame elsewhere." Well I wouldn't say no to three extra days holiday for working half an hour later for two nights. Any thoughts? If there's any RMT or ASLEF members around it would be particularly interesting to hear your views, especially as TSSA and BTOG are both in favour of the deal. A £115 million deal was announced yesterday with the Airwave Radio Network so that there will be be full radio coverage for emergency services at all 125 below ground Underground stations. It will piggyback with the existing Connect digital radio system on the Underground. 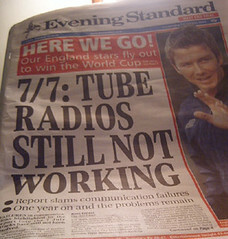 This is in response to criticism that poor communication hampered rescue efforts after the July 2005 bombings on the Tube. Investigators from the London Assembly in June last year said there was an over-reliance on the mobile phone network; that the Tube's radio system was "antiquated" and it was "unacceptable" that rescue teams could not communicate underground. 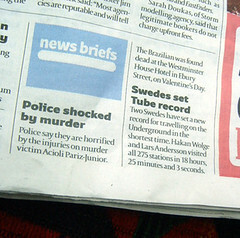 "British Transport Police, which has responsibility for policing on the Tube network, currently have radios that work underground, but other emergency services, including the Metropolitan Police, do not have compatible systems and so need to borrow BTP equipment or be accompanied by a BTP officer when underground. 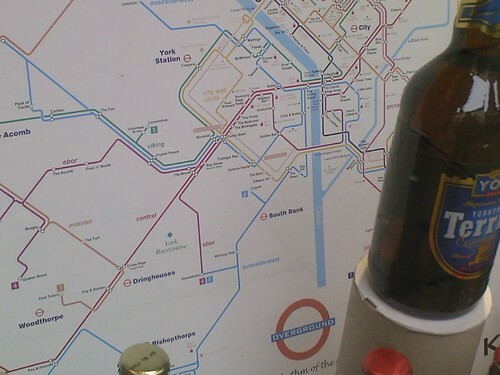 The Connect digital radio network is now live on the Circle, District, Hammersmith & City, Metropolitan and East London lines, and will be rolled-out across the remainder of the Tube network throughout 2007." Ken Livingstone said "The addition of the Airwave radio network to the new Connect digital radio system, currently being rolled out across the Tube network, is good news for London. It will bring added flexibility to the way that emergency services operate underground boosting the Metropolitan and City of London Police response to any incident on the Tube and providing extra reassurance to Londoners." See Transport Briefing for the full report. 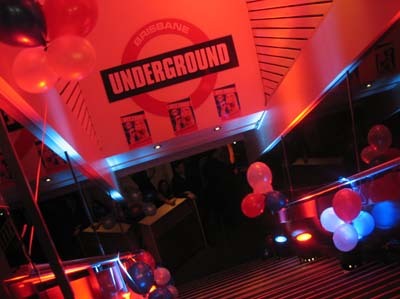 Nightclubs seem to be a popular venue for ripping off - sorry - borrowing the Tube Roundel for their logo. We have Piccadilly Circus in Toronto. Daman Albarn's club in Reyakjavik. A back street club in Napier, New Zealand. 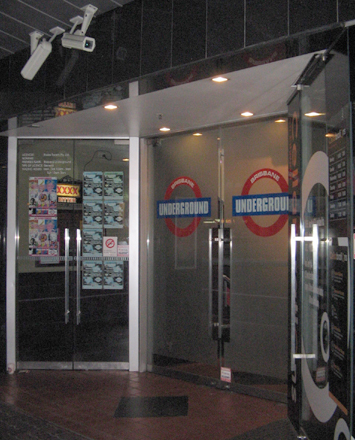 Ben F said "I found myself in Brisbane, Australia recently, and walking past Edward Street in the heart of the city, I passed a nightclub sporting another ripoff of the LU roundel. I couldn't resist dobbing them in...". Keep them coming in and I'll blog and add to the Flickr set. "Hi there, while travelling on the Olympia shuttle the other day I heard possibly the sexiest, most alluring voice ever on the Tube. A French female accent softly purred the destination before reminding us to "Mind ze doors". I noticed she was also very petite and to be frank; cute, as we passed her cab on the way to the exhibition. The following day, she was back on the same run, so we were treated to her announcements again. Sadly, the PA was very poor on this train and I could not get a good enough recording on my phone. If she ever reads this, I would like to thank her for brightening up my day. Top Girl! Just a thought, how about a competition to record the sexiest (Male or Female) announcement on the tube? It appears LUL have cracked down on the humorous varieties, so maybe this would be a good substitute?" It's a thought! 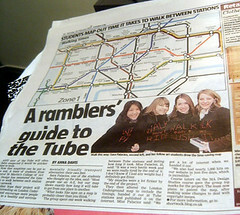 If anyone travels on that District Line to Olympia regularly perhaps you could record the French lady for us. Maybe she could be encouraged to make some of the announcements in French too just to add a bit of variety. It's pretty hard to make recordings of unusual announcements, as they do tend to be one off, so you need to be fast or have someone in full flow. 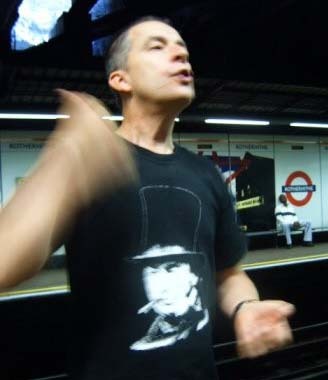 I still thank Nik Fox for the following recording of Richie Vennard with his whole raft of funny announcements on the Jubilee Line. 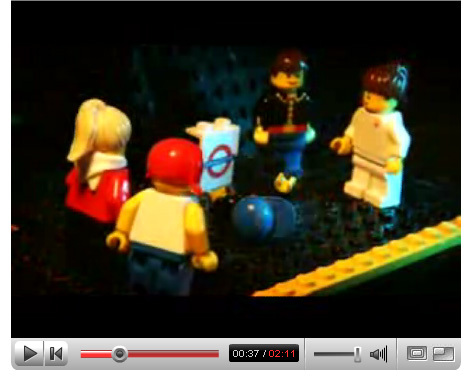 Let us know any lines where there are some good voices and perhaps we can do our own Tube Idol. It's Friday so it's time for the look at people on the Tube who've "taken a style and made it their own" to quote Louis Walsh out of X Factor. The TFV's are back. I really hope that the Hilton bag was holding her "work shoes". Because fishnets and very sporty looking trainers don't do a lot for me. I took this picture on the day we had snow in London and I wouldn't have thought that fishnets were ideal leg covering when it's freezing outside. Furry Ugg style boots, check. Micro mini skirt, check. Glitterati belt, check. Baby Pink cropped parka, check. I think Paris would have been proud. One of those occasions where you want to put on your high pitched Karen Walker (out of Will and Grace) voice, and waggle your finger in amazement. It's not quite tartan. It's not quite MC Hammer pants (like these) They're not quite Twiggy Trousers (like these). They're erm... unusual to say the least. Ah February only two weeks to the 14th. If you're looking for an unusual Valentine's night a two stop journey on the Tube at Wapping might not be what you had in mind. However on Valentine's Day, The Brunel Museum is organising guided journeys of the Thames Tunnel, by Tube, for lovers. By kind permission of a pandering London Underground, couples may see the smooth Doric columns, the deep recesses, the pilasters and porticos of the tunnelling Frenchman, Marc Brunel, Isambard's Dad. Here, before the trains came, were sixty shops with garters, silk handkerchiefs and lovers' tokens in the World's First Underwater Shopping Arcade. Here also at the Thames Tunnel Fancy Fair were novelty acts, sword swallowers and female acrobats, and dark places where lovers might talk until morning. According to Robert Hulse curator of the Musuem and tour leader of this innuendo ridden trip "This is the ride of a lifetime for the Tunneller in your Life. The entertainers have long since gone, but tonight lovers alight from the train to stand, fingers entwined, gazes locked, and open mouthed at the foot of Frenchman Brunel's Wapping Shaft." Underground Valentine Tour until 2011 because the East London Line closes in December 2007 for engineering works for the extension. Tickets cost £7 each or £10 a pair. For more details and to book online visit the Brunel Engine House Museum.